The client is a leading medical imaging organization based in Fremont, California. 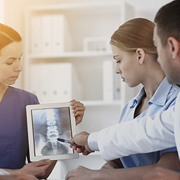 The client was facing excessive backlog in their teleradiology requirement and they were looking for a reliable teleradiology service provider. They wanted services for different imaging techniques including CT, X-rays, MRI, Oncology, US, etc. They had a huge backlog which needed to be cleared quickly hence were looking for a partner who could cater to their needs with a turnaround to 12 to 24 hours. The client was extremely delighted and was not only impressed by our professional approach towards the work but also the cost-effectiveness of the project. The President of the organization even praised our team with his kind words. Outsource2india has been a pioneer when it comes to providing quality teleradiology services and a plethora of other healthcare services. Outsourcing teleradiology services to us can not only help you to save costs but also give you an ample amount of time to focus on your core competencies. Our team comprises some of the most talented and skilled radiologists who can cater to any of your needs. If you are looking for a reliable, cost-effective, and efficient teleradiology service provider, then you have come to the right place. Get in touch with us today!